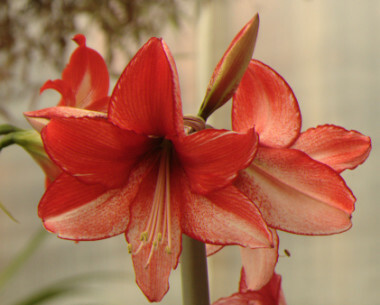 Amaryllis are a popular gift plant, particularly during the Christmas holidays, and after they have finished blooming they make handsome winter house plants. With proper watering and fertilizing, amaryllis should bloom again next spring. Keep the leafy bulb watered and feed the plant weekly with a balanced water soluble fertilizer. When the last flower fades, cut off the stalk just above the place where it connects to the body of the bulb. Don’t remove or damage the leaves. Move the leafy bulb to the sunniest indoor location (plant lights can help). 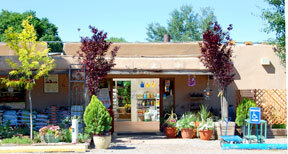 Water and fertilize regularly throughout the winter. After the last frost date (May 15), move the amaryllis outdoors to a sunny location. Water daily. Around August 15, move the plant back indoors. Put it into a cool spot (50-60ºF) in good light, and stop all watering. 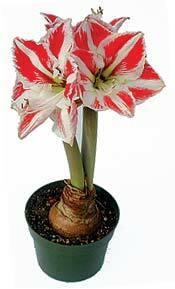 When the leaves have died down completely, move the amaryllis bulb into a completely dark spot to rest for several months. Do not water the bulb during this period. Check the bulb every few weeks or so. Around November 15 the tip of a new flower stalk should emerge from the bulb. Move the bulb into a warm, shady indoor location for 3 weeks. Begin watering and fertilizing again. After 3 weeks, re-pot the amaryllis into fresh soil (do not bury the bulb’s top) and place it in the sunniest spot available. Repeat annually! e plant back indoors.